Colorful appearing rooms accompanied by an in-house restaurant and a bar. Santhi Inn on Jawahairlal Nehru street is a classy and comfortable hotel with its own in-house restaurant and bar. 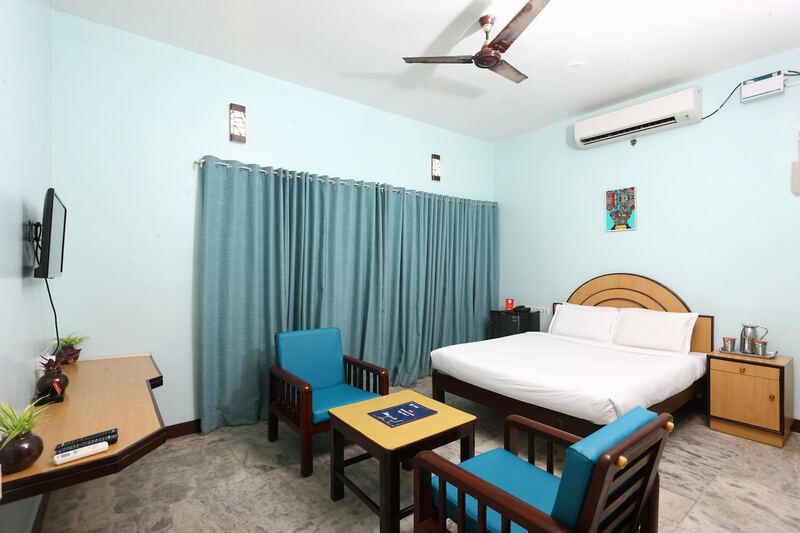 The rooms of the hotel are done in a bright fashion that adds extra life to the already lively surroundings augmented with the natural sea breeze. Provision of various amenities ensure comfortable stay. CCTV cameras are installed in the premises to ensure security of your stay. Facilities like power backup, mini fridge and elevator are offered for a convenient stay. The hotel also has a number of popular eateries in its vicinity including Dominos Pizza and Thanco's Natural Ice Cream. Bay of Buddha, Puducherry Museum, Batik Section, and the beach are just a few blocks away from this stunning place.